In a 5-4 ruling, the Court smacked down and embarrassed the California legislature and Governor Jerry Brown for the so-called “Reproductive FACT Act. States nationwide are now on notice not to attempt to duplicate this pernicious social engineering law. The Reproductive FACT Act (FACT stands for Freedom, Accountability, Comprehensive Care and Transparency) was passed by the California Legislature in 2015 … and signed into law by Governor Brown. The law coerced private pro-life clinics and crisis pregnancy centers into promoting state government-funded abortions … forcing pro-life Christians into advocating abortion against their will. This is another example of how President Trump’s appointment of Neil Gorsuch to the Supreme Court is transforming things for the better. what is that? A lot of babies in heaven though. Thank you president Trump for appointing justices with a moral cumpass! Thanking God for setting the absolute moral compass and President Trump for staying on HIS predetermined course. America is becoming great again! You are right about the president’s appointment of Neil Gorsuch. That is one of the single best things that Trump has done, and that alone is a major reason to be happy that Trump was elected. 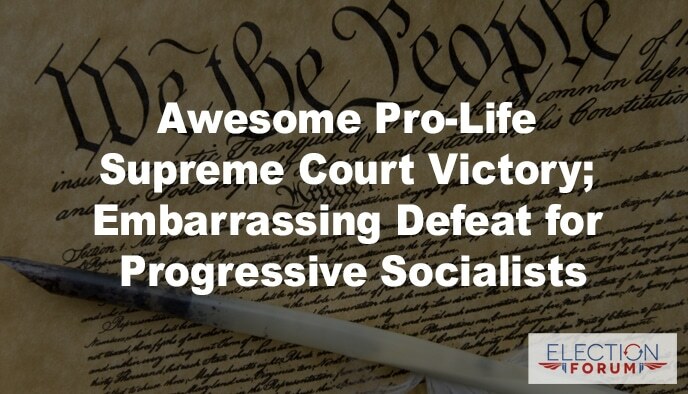 Also, you are right that this is not just a pro-life victory, but also a victory for freedom of religion and freedom of speech. The notion, in this case, of forcing people to express something that they don’t believe in is akin to the Masterpiece Cakeshop and Sweetcakes by Melissa cases, and is repugnant to human decency. I have lived in California for 60 years and I have never seen a governor so hellish as Jerry Brown. It is extremely frustrating to live in a place where laws that are against God’s will are being put into place without our knowledge or permission. Seems like communism and socialism reigns here.This has been a state controlled by the homosexual agenda and Jerry Brown is right in there as their pawn because he’s one of them.It’s a sin that has gone on for too long. I pray that godly influnced people will be elected to replace the ones who have been Satan’s workers hell-bent to destroy California. I thank God for President Trump. Lets get together and work to make California great again! What a relief! But the war isn’t over; prayer, action, unity are still needed. All of the comments are so awesome in support of President Trump. I Thank God for this man and his heart for God’s will in our Nation!!! California will be great again… Brown will be out and all that he represents will go with him. American will be great again. Totally on it’s way. God Bless America!